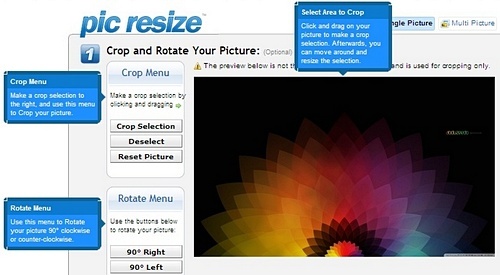 Choose the output format type JPEG,PNG,GIF and click “Resize Pic”. 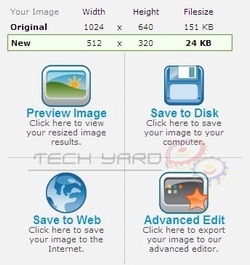 Pic Resize also supports batch resize, using which multiple files can be uploaded and all them can be resized at once and can be downloaded as a single zip file.It supports resize be 75% smaller, 50% smaller and 25% smaller can be saved as JPG, PNG or GIF. All resize images are stored on their server for only 20 minutes after which the images are deleted.After successfully resizing the images can Save the image online and share it with your friends or use their advanced editor for more editing options where your image automatically loaded by clicking on the “Advanced Edit” Link.